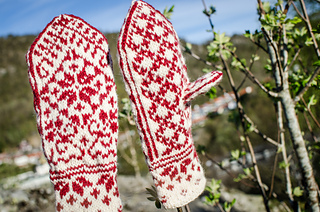 Kvello is the fourth and final pattern in the Selbu mitten club. This pattern has the most intricate chart of them all, but follows the same construction method as its predecessors. 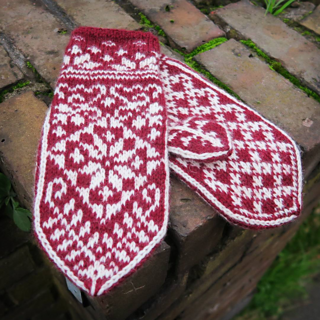 So what you get is a relatively quick and easy to make, but impressive looking, pair of mittens. I will readily admit that these are my favourite mittens in the club. You will as ever be fine with a 50 g skein of each colour, using DK weight yarn - or heavy sport/light worsted that is suitable for a 22-24 sts gauge. 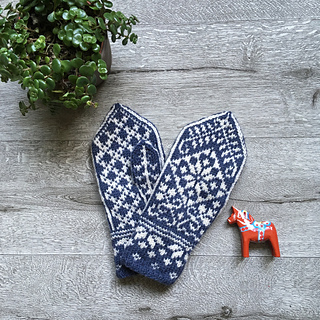 I used the wonderfully soft and squishy Woolyknit DK BFL yarn which I highly recommend for those of you with more sensitive skin out there. 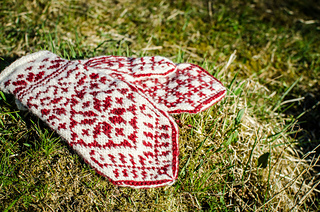 However, I still insist that yarns like Rauma 3 tråds Strikkegarn and Navia Trio will give you the best result. If you need any help with this pattern then this topic in my group is the best place for support. Thank you so much for taking part in this journey with me! I could never put into words how much it has meant.